This research aims at a new development in the research on the "Marxian optimal growth theory" in the mathematical Marxian economics. By the help of this budget, I has been able to develop the following researches. ① I wrote a paper to explain the new achievements of the value theory, surplus value theory and interest theory of "Marxian optimal growth theory" . This was published as a paper in "Mita Journal of Economics", and also presented at related academic societies. Specifically, in the annual conference of the Japan Society of Political Economy, I set a special session to discuss the recent development of the Western Marxian Economics. There I coordinated three reporters, and made comments on their presentations. That discussion was related to the Okishio's Fundamental Marxian Theorem, the problem of quality of labor and so on. This session will be continued in the next year. ② Another research field was the relationship between 'Marxian optimal growth theory' and economic policy theory. "Marxian optimal growth theory" implies that a long-term decline in growth rate and reduction in government scale. If so, what kind of policy theory is necessary? I was asked to write two papers on this issue. ③ The relationship with historical materialism will be published as a paper which models the mechanism of the change in superstructure caused by the change of economic base. This new academic achievement was also reported at the international conference held in Xiamen in October. This framework can be applied as a problem of conversion of the hegemon countries in the world system. 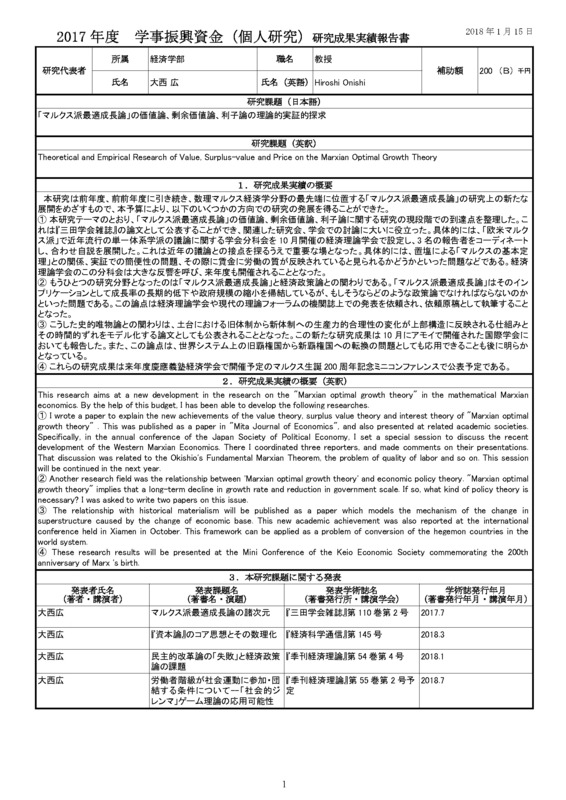 ④ These research results will be presented at the Mini Conference of the Keio Economic Society commemorating the 200th anniversary of Marx's birth.